“Therefore the king asked advice, made two calves of gold, and said to the people, ‘It is too much for you to go up to Jerusalem. Here are your gods, O Israel, which brought you up from the land of Egypt! '” (I Kings 12:28). So begins the sad testimony of Israel’s fall from being a holy people to a backslidden nation of idol-worshippers. How is it that, in such a short time after the completion of the Temple in Jerusalem, Israel could be led astray? There is a prophetic application to our current situation. These things are written as an example to us, so let us look at this defining moment in Israel’s history and see what lessons can be learned. It is never wise to force any interpretation beyond a few main points, because the Kingdom of Judah was not much better than the Kingdom of Israel. But by way of a general application, we will simply note that Judah contained Jerusalem; and however much it failed to measure up to God’s full thought, Jerusalem was intended as the center of worship and the place where the Lord said He would make His presence to dwell. We know that Jerusalem contained the Temple and the Levitical priesthood. After the death of Solomon, the kingdom was divided between two men: Rehoboam, the son of Solomon; and Jeroboam, the servant of Solomon. Rehoboam became the king of Judah, and had Jerusalem as his capital. Jeroboam became the king of Israel, and his territory was all the land to the north. And so we have a kingdom divided against itself; essentially, two nations existing side-by-side. This sets us up for controversy and competition. Judah is centered in Jerusalem, worships God in the Temple, and is led in that worship by the Levitical priesthood. It is not too difficult to see that Judah represents a remnant within Israel. Judah is one tribe, while Israel is ten tribes. Our Lord Jesus Christ is the Lion of the Tribe of Judah. All who belong to Christ are spiritually counted in this tribe of Judah. Our Jerusalem is from above, we are the Temple of the Holy Spirit, and we are all kings and priests in this holy nation of peculiar (set apart, special) people. I trust you are familiar enough with your New Testament to recognize these truths without me having to provide chapter and verse. Well, Israel came to represent something quite different from Judah. Although Judah came out of Israel, it definitely stood apart from Israel. So what do we see in the divided kingdom? We see the Church that Jesus is building as something over and above the “Church” that man is building. Whether you call it the Institutional Church or Organized Religion or the Harlot Church, it is an alternative religious system that exists right alongside the true expression of Spirit and Truth in New Jerusalem. As we will discover, Organized Religion is, for all intents and purposes, a Convenient Cult. “And Jeroboam said in his heart, ‘Now the kingdom may return to the house of David: if these people go up to offer sacrifices in the house of the Lord at Jerusalem, then the heart of this people will turn back to their lord, Rehoboam king of Judah, and they will kill me and go back to Rehoboam king of Judah'” (I Kings 12:26,27). So here is Jeroboam, the rebel king of Israel. He has control of ten tribes. He has more land and more people than Judah. Even so, he is troubled. What troubles him? There is the issue of people being commanded by God to go up to Jerusalem to worship. Jeroboam correctly surmised that once the people went up to Jerusalem to worship they would be more inclined to live there, and his kingdom would be diminished. I would suggest that today God is calling on us to come up to Jerusalem and worship – that is, to worship Him in Spirit and Truth (cf. John 4). The Father seeks those true worshippers who do not think of geographical places of worship, but a Spirit-and-Truth place of worship: a spiritual place, a place of the heart. That is what it means for us to “go up to Jerusalem”. This Jerusalem is from above, it is from the heavens; we have to “go up” to it because it exists on a higher level, a greater dimension. It is a spiritual place. We read about it in the Book of Revelation, coming down from heaven, filled with the glory of God and the presence of the Lamb. Many are responding to this call to go “up to Jerusalem” and out of Babylon, out of Churchianity, out of Organized Religion. As a result, all the Jeroboams of this world are in a state of consternation! How can we prevent this mass exodus of people from leaving our churches? Jeroboam’s concern is not for the people. His concern is not for the Lord, or for what the Lord requires. Jeroboam’s concern is only for self-preservation: the safeguarding of his leadership, the continuance of his kingdom, the prolongation of his own life. The solution he came up with was quite resourceful. He created what I am calling “A CONVENIENT CULT.” This convenient cult has three characteristics: 1) a convenient place; 2) a convenient priesthood; and 3) a convenient feast to bind the worshippers together. Let us look at each one particularly, and see if we can find a prophetic application to the time and season that we are a part of. “Therefore the king asked advice, made two calves of gold, and said to the people, ‘It is too much for you to go up to Jerusalem. Here are your gods, O Israel, which brought you up from the land of Egypt!’ And he set up one in Bethel, and the other he put in Dan. Now this thing became a sin, for the people went to worship before the one as far as Dan.” (I Kings 12:28-30). Jeroboam was smart enough to appeal to that part of human nature that is attracted to convenience. Convenience! “It is too much for you to go up to Jerusalem.” In other words, it’s too inconvenient to worship God in the way that God requires. The cost is too great. If you consult a Bible map you will find that Jeroboam strategically located his golden calves in the extreme northern and southern reaches of his kingdom. You could simply attend the golden calf that was closer to you. This is a clever bit of marketing that good restaurants use when selling desserts. They do not ask if you want dessert; they ask if you prefer chocolate cake or banana cream pie for dessert! Of course, you could refuse both, but when the question is put to people in this way, statistics show that most of them will select one of the options presented, and they end up buying a dessert. 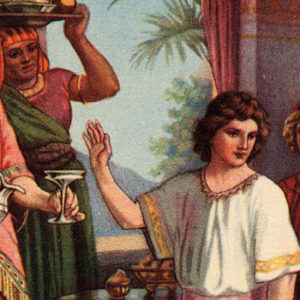 So Jeroboam did not ask anyone to decide between a golden calf and Jerusalem; he simply offered them a choice of “desserts” – which alternative do you prefer: Bethel, or Dan? He reduced it all down to a matter of convenience. “It is too much for you to go up to Jerusalem.” Too much! Today we have a myriad of worship choices, a multitude of golden calves located on every street, some sitting right next to each other, each one competing for people. What is the basis of their marketing message? Convenience! A choice of service times so you can choose the one that is convenient for you. A choice of worship and preaching styles so you can choose the one you are most comfortable with. So many choices, so many options. If we stop and think about it we may realize that God is not asking us to choose which golden calf out of thousands we want to worship at. He is asking us to choose between that whole “golden calf system” and a Spirit-and-Truth life in New Jerusalem! God is calling us to leave that false system behind and do something that is totally inconvenient – to “go up to Jerusalem”, join the Church that Jesus is building, and learn how to be a nation of kings and priests. It should be noted that when Israel did the convenient thing, the most expedient thing, the most practical thing, it became a sin to them. It led them far away from God and brought them under judgment. The convenient path is a wide path, and it leads to destruction. Worshipping God in Spirit-and-Truth and leaving behind the familiar ways and the popular paths is inconvenient and costly, but that is precisely why Jesus said to count the cost before you become His disciple. “[Jeroboam] made shrines on the high places, and made priests from the lowest of people, who were not of the sons of Levi” (I Kings 12:31). A convenient cult needs a convenient priesthood to manage, maintain, superintend, and lead it. According to God’s thought, only the Levites were called to serve Him as priests. Since all the Levites were in Jerusalem serving in the Temple, Jeroboam has to find another priesthood to support his false system. Jeroboam’s solution was to make it easy – convenient! – for anyone to become a priest. Never mind the calling of God. Anyone who took it upon themselves to be a priest would be ordained by Jeroboam and could achieve instant leadership status. And so the lowest of the people could now seize the opportunity to become lifted up above the people. What does it take to be an apostle? What does it take to be a prophet? These days, apparently little. Simply calling yourself something, or allowing other people to call you something, is enough to make you somebody special. How very convenient! We are inundated with people who take upon themselves the title of apostle, bishop, prophet, prophetess, pastor and “first lady” (perhaps the most carnal title of all). The point is that when “everyone” is a priest then it is very difficult to tell the difference between the priests of the Lord and the priests of the golden calf. When “everyone” is a prophet, how do you discern between a true word and a false word? Most people cannot, and so the deception is perpetuated by way of convenience. The reality is that there is a tremendous cost associated with answering the call of God on your life, and if you really live the Christian life the way it is intended to be lived – “not I, but Christ” – it will (at times) be inconvenient, awkward, untimely, and problematic. And when God places you in a position of responsibility for others then the difficulties will increase a thousand fold. It will not be “easy”, but for those who value the truth above convenience, this way of life in Christ is its own reward. “Jeroboam ordained a feast on the fifteenth day of the eighth month, like the feast that was in Judah, and offered sacrifices on the altar. So he did at Bethel, sacrificing to the calves that he had made. And at Bethel he installed the priests of the high places which he had made. So he made offerings on the altar which he had made at Bethel on the fifteenth day of the eighth month, in the month which he had devised in his own heart. And he ordained a feast for the children of Israel, and offered sacrifices on the altar and burned incense” (I Kings 12:32,33). A convenient cult needs some kind of convenient celebration, or feast to bring its worshippers together on a regular basis. 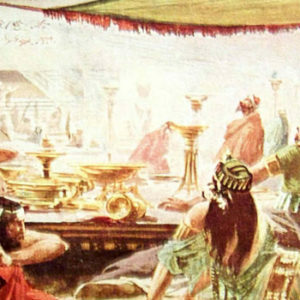 Jeroboam decided to hold a festival “like the feast that was in Judah.” Of course, it was NOT the same feast, it was only a counterfeit of the feast of tabernacles. The real feast was in Jerusalem. 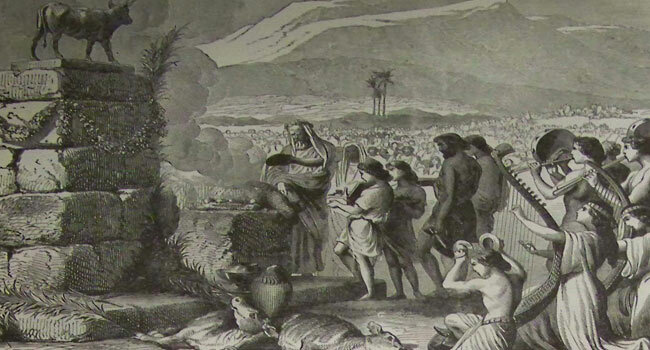 Jeroboam’s feast was something devised, invented, and designed by Jeroboam. A convenient place, a convenient priesthood, and a convenient feast makes the convenient cult complete. The end result is an alternative system of religious activity that claims to worship God, and has an appearance of piety, but is far more convenient and appealing to the flesh. God used a prophet from Judah to challenge the false system of religious worship that Jeroboam had installed, and prophesied its destruction. It was not a “convenient” word to deliver. After pronouncing destruction upon Jeroboam, the prophet himself was disobedient and destroyed by a lion. If you would not listen to the prophet’s word, maybe you would learn from the prophet’s example! Jeroboam, though momentarily shaken, simply continued in his disobedience, and was judged accordingly. But the damage was done and Israel was doomed. It isn’t difficult to see how history has repeated itself in the last two thousand years. Like Israel of old, we live in a “divided kingdom” where the Religious Majority perpetuate a cult of convenience, and the Remnant Minority seek the Lord’s full thought, mind, heart, and will for the Church that Jesus is building, a spiritual house of living stones, a “New Jerusalem” of kings and priests. Both are considered “Israel”, but only one is the true Church, while the other is a convenient distraction. Eventually, even Judah fell to idolatry and came under judgment. The Temple was destroyed and Jerusalem was burned. God had to work with a Remnant within the Remnant, and He continued His Kingdom along spiritual lines. The Lord continues to work with a Remnant today, calling them to “go up to Jerusalem” and set their affection on things above. Because God is working along spiritual lines to accomplish a spiritual purpose, the boundary between backsliding Israel and spiritual Judah, between golden calf worship and Spirit-and-Truth worship, is a lot more subtle. But once you have seen the Church that Jesus is building it is much easier to reject the golden calves. Jeroboam knows this, and will make his alternative very attractive – and very convenient. May the Lord quicken this word to our hearts. Amen. Amen to that! I completely agree! Very interesting comparison. I have “come out” of the religious system, and am most comfortable with my relationship with the Lord and with His people of all kinds. i can completely see how all this makes perfect sense and it is the way i live my life. although coming out of religion, in this sense has sure made me feel like there must be something wrong with your teachings..not because there is something wrong, but because of what i have been taught all my life. there is always a voice that says “this isnt true.” i cannot even tell you how often that happens..yet it all makes perfect sense because it seems to be what the Bible truly says. i know God is with me and leading and guiding me into the Truth, its just really hard to get all that old stuff out of your head even if you know none of it felt right. it feels right to have God in my life and to be closer to Him than ever, when i was in church growing up we were never taught closeness and decipleship. thank you for your teachings, and for being Christ centered always. I completely agree with this. I have pulled out of organized religion. I just could not go and sit through it any longer. It is a country club! My husband still attends,but I feel dirty and almost embarassed to be a part of what they are doing. I would never want Jesus to find me in church. I think back to the scripture and the only thime he showed any anger was when he “saw” what was happening in the house of God. What exactly is organized religion? Meet and greet (uncomfortable) 4 songs, a sermon read from notes, the benidiction,and lunch…it is really kinda sad if you spend much time in thought about it. I see why the world makes fun of Christians and basicly hates them…they say one thing and 2 seconds out of the “building” they are doing something that is in dirrect opposition to the pep talk they just recieved. There is not a lot of “real” the world sees. They are always telling everyone how good God is but by the way they live and treat others…who would want to be like them. Jesus said we were to be the “salt” that makes men thirsty. I think we are the stinch that turns man’s head. I pulled out and wanted to no longer be associated with organized religion at all. For further info I live in a small town and we have more churches than you can shake a stick at…they fight within them selves, they back stab, they gossip,and yes they occasionaly help others. We have one large church in our area I call it the “sports” church, because they are heavily into all things sports. My dear friend went to church there…she battled cancer for 4 yrs…not once did the pastor visit her, except for the last day here on earth. He had to be asked to leave the room so her body could be removed from her home. He was more intrested in seeing her dead that alive. We also have a small one that is dominated by women, who are quite vicious and prideful… The men are showpieces women run and prophesy everything.One woman there will actualy stop everything and tell people ” Jesus just told me to tell you …”I thought really…if Jesus spoke why would we not all be on our faces, why would only one woman know this…there was no sense of the spirit at all. She of course is highly ranked in her little group.I believe it is an attention seeking behavior. When the church begun there was an amazing spirit of worship but now they are trying to copy a popular harp and bowl movement and it has gone south…saddness my freind, that is how I feel. Great word, brother Chip, as always…very good comparison…There is NOTHING convenient or easy about laying down your life & taking up His life but it is so worth it…It will cost us everything maybe even our own life someday, but He must increase but I must decrease & the rewards far outweigh the cost as the greatest reward we could be granted is more of His Presence. Very powerful and compelling stuff! I have just ‘retired’ from eldership in my local (Irish Presbyterian) church, being unhappy for a long time about the church-damaged folks I see around me and the self-serving ‘business’ that our churchianity has become. But I’m still nervous of being a ‘Lone Ranger’. There seems to me to be a requirement to be in Fellowship with other believers and to be taking communion with these ‘in remembrance of Jesus’ on a regular basis. But certainly our worship is getting worse and worse. Yes, and amen! Praise God that He loves us enough to show us the truth that we might not be caught unaware. Also, please look at Deuteronomy 8. Our country itself is headed toward judgment because of the apostasy of the Church (organized). I have mentioned this danger and the state of the “Church” to my co-workers, posted comments on facebook,etc., and I get NO response. People just go along with their little lives, completely self-absorbed. I believe people, even those who call themselves Christians, don’t care one whit, as long as they have ministers/pastors/elders/apostles/prophets/and, yes, “first ladies” to tickle their ears. “Just as in the days of Noah, they will be eating and drinking, marrying and given in marriage, and they did not understand until the flood came and took them all away.” I am deeply grieved about what is happening in American and on the earth; however I do know that when these things begin to happen we are to look up and lift up our heads because our redemption draws near. Please pray for the strength to endure, remnant church, and that He may keep us from the wrath that is to come. p.s. my husband and I have been out of the organized system for 15 years. It’s wonderful! Only then are you able to know the truth, more and more truth each day, month, and year! Paise God for the insites and revelation on the subject matter. My wife and I have been out of the orgainized church for over a year now and the freedom we feel and the spiritually growth is awesome. I am new to this site and am so grateful for it, I am learning ever more of the purpose of Jesus calling us out. I am looking forward learning through you site.